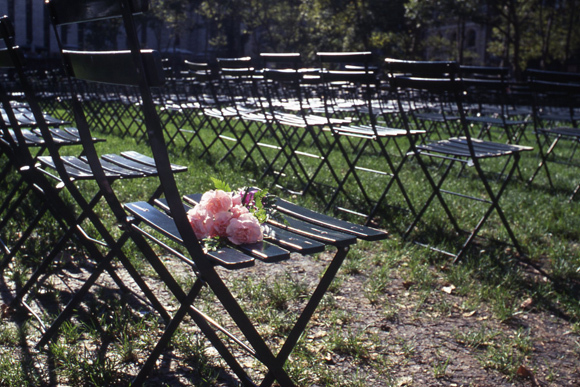 One year after the September 11, 2001 attack on the World Trade Center in New York City, Bryant Park Corporation set up a temporary memorial of 2,819 empty chairs on the lawn, one for each of the lives lost in the attacks, facing the site where the Twin Towers once stood. 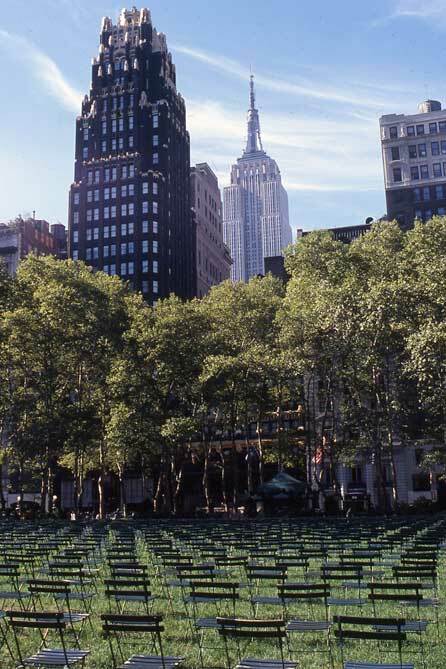 This year, as the world remembers the tenth anniversary of 9/11, we will stage a similar memorial on the lawn with 2753 chairs, reflecting a number established by the Medical Examiner's Office. In addition, Sheryl Oring will present an interactive public art project called Collective Memory, which will take place simultaneously on the Upper Terrace. For three days a pool of ten typists will record park visitors’ answers to the question, “What would you like the world to remember about 9/11?” Answers will be typed on small white sheets of paper, and collected to be included in a forthcoming exhibition. Beginning in the afternoon on Friday September 9, you can also view these remembrances on Flickr with the BryantParkNYC Collective Memory Set.